Continuous improvement is our goal here at Hellpellet Intl. So here’s a list for next year’s ride. 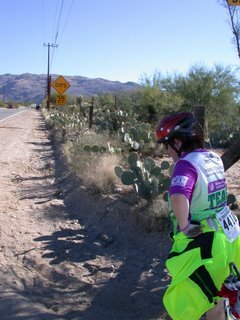 Take peyote at mile 30. Hell, we’re in the desert, right? Redose at mile 80. That should pretty much cover us. Finish in less than 8 hours. Don’t forget to take Kewyson’s cell phone number. Sorry we didn’t hook up in Tucson. Don’t get 2 flat tires on the course. That plus 10 other stops = way too much course time. Take lots of photos. Most of the time it’s about the journey, not about the finish. Love the picture – does the sign refer to people on the ride or the road? Also, I’d take the peyote earlier. You’d get the vomiting out of the way by mile 20 and would be free to enjoy the rest of the ride. And congratulations on getting it done.